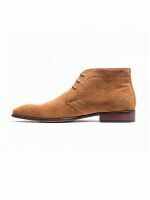 This modern take on the Chukka boot binds the perfect combination of tradition and modern-day comfort with its 3-piece Italian suede leather design. A double stitched up half-way through the Quarter diverges into 2 single stitch rails that elegantly frame the rest of the boot up to the back. Its stylish squared chisel toe adds extra comfort while its hand-made branded leather sole completes this sartorial piece with a "Gentleman's cut". Designed with Italian Suede leather upper, and Italian premium leather for its lining, and removable sock, the Blake stitched Tobacco Suede Chukka Boot fuses one of the most durable and flexible materials in shoemaking with masterful craftsmanship for a comfortable yet sophisticated shoe.